Aside from Harrison Ford jumping off a dam waterfall, the most iconic scene from the 1993 film, The Fugitive, is the escape sequence where a freight train smashes into fugitive Richard Kimble’s transport bus, and the carnage left over from that collision can still be found in the Great Smoky Mountains. The scene was shot on a stretch of the Smoky Mountain Railroad using the most practical special effects of all, a real train and a real bus. The movie was made far before CGI effects became the standard in filmmaking, and instead of using miniatures the filmmakers simply placed a full-size bus in the path of an oncoming freight train, and let physics do the rest. 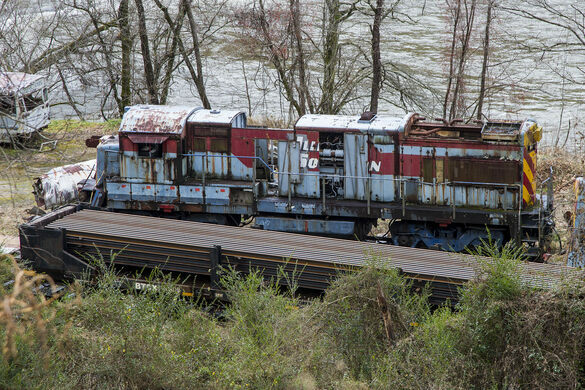 The bus was nearly torn in half by the impact, and the train was made to derail after the collision leaving nothing but mangled wrecks in its wake. 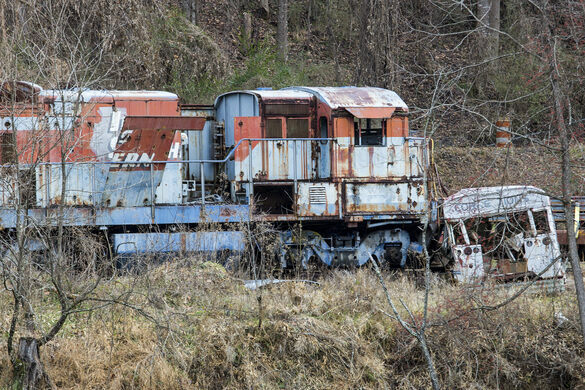 In the film, fugitive Richard Kimble narrowly survives the destruction, going on to find the man who really killed his wife, but in real life it is the wrecks of the train and the bus that continue to survive. Rusting away on the side of the tracks near where they were destroyed, the train still bears the logo of “Illinois Southern,” and the bus is still mocked up to look like a Corrections transport. 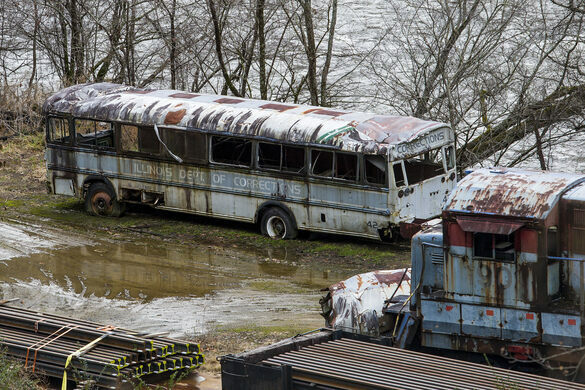 Fans of Harrison Ford, Tommy Lee Jones, and justice will find no better place to pay pilgrimage than The Fugitive wreckage, which will likely outlive the movie itself. Park on the side of Haywood Road near the Jackson County Green Energy Park and look down the slope across the street to see the wreck. A refurbished locomotive from a bygone era in the middle of the Jordanian desert.